What do a 15-year-old art museum theft, the murder of a middle-aged art gallery owner, a would-be novelist, and an African American gang member have in common? If you said a feisty 20-something legal intern working to garner a place in a New York law firm, you’d be right on target. Cynthia Jakubec, “Jake” to her boss, discovers herself embroiled in a murder inquiry with more twists and turns than a Raymond Chandler story. Jake’s investigation on behalf of Luis Mendoza’s Pittsburg law firm takes her from a wealthy Pittsburg mansion to a small African American ghetto church, to New York’s high class hotels as she pursues leads that will bring the murderer of Thomas Bradshaw, art gallery owner, to justice. Jake’s client, Caitlin Bradshaw, is the daughter of the murdered man and Jake works overtime to keep one step ahead of the Feds and the local police and to keep their attention focused away from her client. Her activities on behalf of Caitlin drive her focus to one character in particular and while clues pile up connecting the murder with that 15-year-old art theft, Jake finds herself wrestling with personal demons on the home front and the mystery heats up. Employing her intuitive skills, Jake works her way through the maze of clues and red herrings that tumble in her path until she learns the disarming truth about Thomas Bradshaw’s murder. Author Locke displays a strong ability to use description to her advantage, painting clear pictures of settings and characters for the reader. She effectively creates characters the reader immediately likes as well as those the reader gets to know and distrust, if not downright dislike—in some instances, taking the likable down a different path. In the end, Ms. Locke ties up most of the details in a satisfying manner, but getting there is at times a challenge. While red herrings are welcome in a mystery, long trips down side roads generally are not and Locke included several long narratives that diverted attention from the true flow of the story. These trips may add a certain amount of color or background to the story, but could have been shortened, putting the attention back to the suspense and conflict due the story. 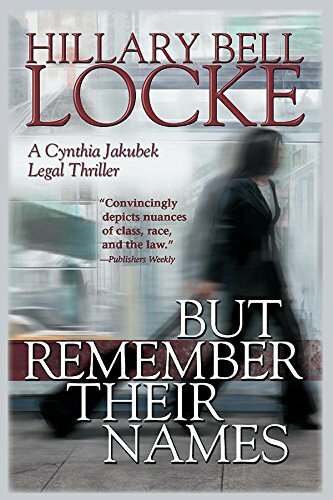 It should be noted, however, that when Ms. Locke focuses on the details of the story and leaves the side trips, her use of tension and conflict is well handled and it is at those times when the story’s pace moves along at a brisk clip. One technique she uses is minor, but disconcerting all the same. Throughout the story she effectively uses first person point of view, but at two places in the story Ms. Locke narrates in third person then jumps back into the first person. It is clear in these two chapters that she was uncomfortable or unsure of how to make her point in first person. As the reader wanders down the path toward the end of the story, he should arrive at the same solution just one nanosecond after the protagonist. In But Remember Their Names some of the clues, red herrings, and foreshadowing are buried a bit too deep and appear to Jake as hidden "ah-ha!” moments. It is these moments when the reader is not exposed to the same information, and that makes the reader’s arrival at the end of the story and discovery of the real culprit a bit more untimely. These items notwithstanding, But Remember Their Names is on the whole a good read from a first-time writer who uses her education and background in law to her advantage—and to the reader’s overall satisfaction.